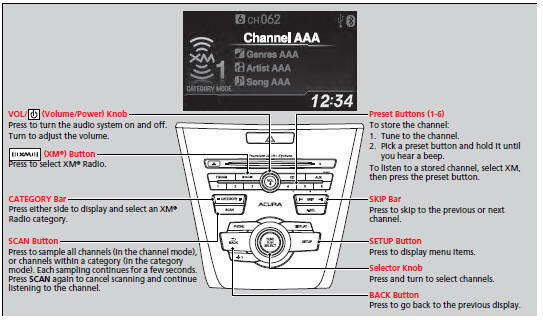 1.Press the button to select the XM® radio band (XM1 or XM2). 2. Press the SETUP button, rotate to select XM Mode, and press . Rotate to select Channel Mode or Category Mode, then press . 3. Select a channel using the TUNE ( ), SKIP, CATEGORY, SCAN, or Preset buttons. 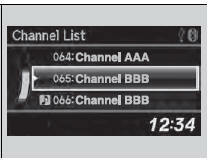 In the channel mode, all available channels are selectable. In the category mode, you can select a channel within a category (Jazz, Rock, Classical, etc.). You can store twelve XM® stations in the preset buttons. XM1 and XM2 let you store six stations each. There may be instances when XM® Radio does not broadcast all the data fields (artist name, title). This does not indicate a problem with your audio system. 1. Press to display a channel list. 2. Rotate to select a channel, then press .